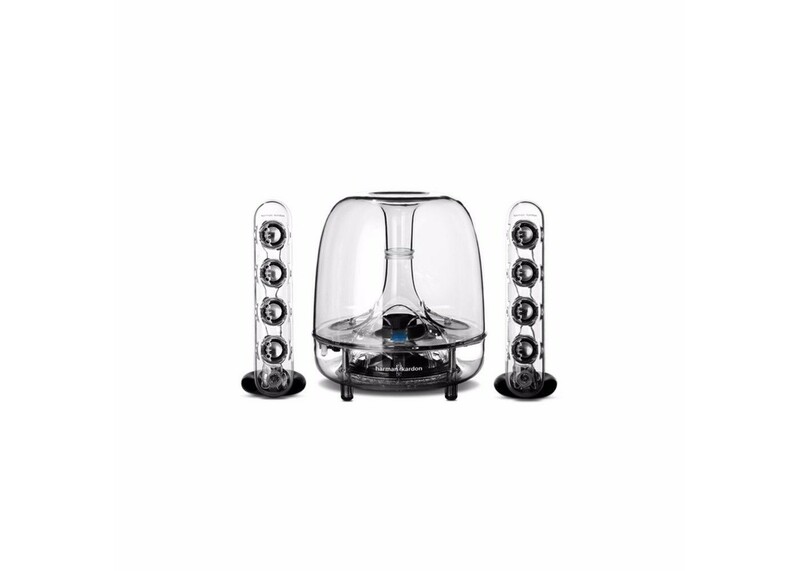 You will receive: 1 Harman Kardon SoundSticks Wireless Bluetooth Three Pair Speaker SystemThe Harman Kardon SoundSticks Wireless speaker system evolved from the SoundSticks II that now resides in the permanent collection of NYC’s MoMA. Taking the inspired design of its elder, Harman Kardon ngineers improved the aesthetic with slight visual enhancements, and added Bluetooth technology for a more seamless listening experience. Featuring a six-inch subwoofer, eight full-range drivers and 40 watts of amplification, the SoundSticks Wireless delivers the same beautiful sound and pop-culture appeal as its predecessor, only now you can seamlessly stream audio from any of your favorite Bluetooth-enabled devices – be it your iPhone, iPad, laptop, tablet or MP3 player. HARMAN TrueStream allows you to wirelessly connect Bluetooth-enabled devices to get superior sound quality without the need for wires or docking. No need to mess with wires. Play audio from your Bluetooth-enabled devices (such as your tablet, smartphone, laptop and MP3 player) with HARMAN TrueStream, which offers audiophile-quality sound. The down-firing subwoofer keeps your lows consistent, precise and powerful, all while reducing distortion and noise when listening to audio at higher levels. The flared port also increases bass output, and can be easily adjusted to fit any room. The stunning, translucent speakers were a hit with art lovers worldwide, earning them a pedestal in homes, offices and the permanent collection of NYC’s MoMA. Raise, lower and mute volume with a simple touch; it’s exceptionally easy to use. The SoundSticks Wireless connects to virtually any media player, offering maximum flexibility. Use it with your iPhone, iPad, computer, tablet, MP3 player and other popular media devices.